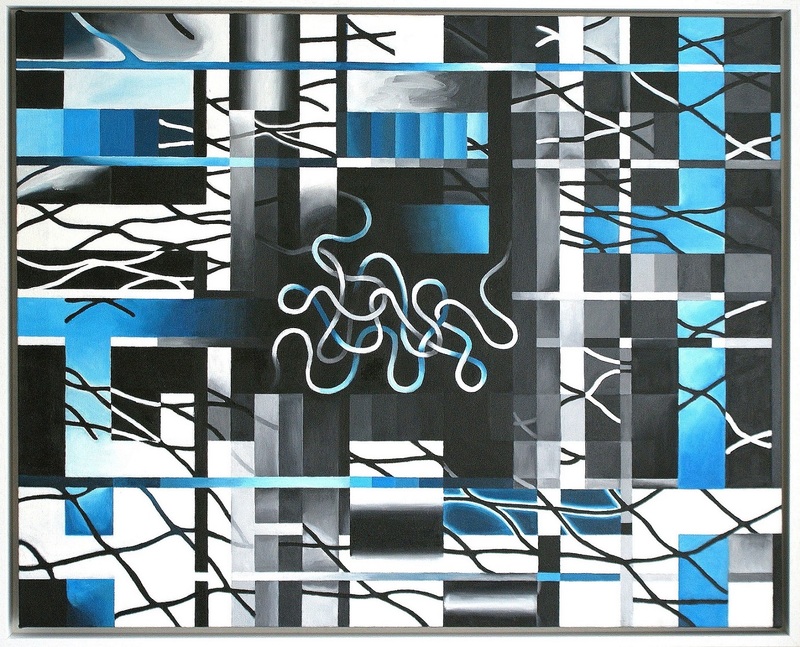 ‘Entanglement’ explores disparate elements of interlaced curvilinear net and the geometric, irregular grid. The work explores the tension between the analogue and the digital, alluding to complex relationships and our entanglement with the real and digital worlds’ controlling systems. Blurred and simulated gradient banding (inaccurate colour presentation in computer graphics), glows, metallic shine and a digital ‘printing’ cyan refer to the digital (blue is the most common corporate colour on the Internet), contrasting with ‘analogue’ oil paint and traces of brushstrokes or imperfection. Areas of calm co-exist with busy regions showing rupture and fragmentation, amplified by sudden spatial and chromatic/tonal switches. Illogical space and broken elements or cut-off lines alternate with curvaceous net lines. Isolated lines or fragments speak of broken connections, discontinuities or unforeseeable events; empty spaces or voids allude to human absence, anxiety or isolation.